My heart weeps for those so suffering. Driven from their homes by firestorms, not knowing if they will return to a welcome home, or to a smoking ashen ruin. The world can be such a beautiful place. Southern California holds some of the greatest delights on earth. But with the beauty and splendor, there lurks insidious danger. The architecture and climate of many S.Cal locales lends itself to this kind of wildland fire event. Native chaparral is adapted to thrive in the xeric environment that is natural to so many of the areas that burned. And the notorious Santa Ana winds, so wild and unpredictable, are born and formed in the natural topography of the region. They come raging downslope, from the high desert toward the ocean, dessicating every bit of moisture from the air and from the plants, and the fuels on the ground. Under those conditions it only takes a tiny spark to start up an incendiary inferno. In these circumstances most of the firefighters can only stand and watch it burn. The danger to human life is far to high to allow them to protect property. When the winds finally subside, the firefighters can move in and establish containment lines, hold the flames in check, and wait for the fire to burn itself out. These guys were very lucky. They got caught by the firestorm on an exposed ridgetop. On realizing that their escape route was cut off and their water supply interrupted, the team leader ordered them to deploy their emergency fire shelters. Fortunately, a helitanker was able to drop water on top of them before the fire became too intense. Their shelters protected them through the hottest period of the firestorm. This Preliminary Summary Report is intended as an aid in accident prevention, and to provide factual information within a short time frame. Information contained within may be subject to revision as further investigation is conducted, and other reports and documents are received. Twelve OCFA firefighters were advancing a progressive hose lay on a hillside near a road cut along Santiago Canyon Road in eastern Orange County (Unincorporated). Upon reaching the top of the 200-foot hill, their hose line apparently ruptured, causing them to run out of water. As fire encroached upon their position, the firefighters deployed their fire shelters, and all twelve firefighters escaped injury. 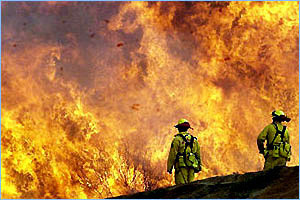 A wildland fire was reported near Santiago Canyon and Silverado Canyon at 1755 on 10/21/07. The Orange County Fire Authority dispatched a watershed fire assignment, and initial reports indicated a 20-30 acre fire. 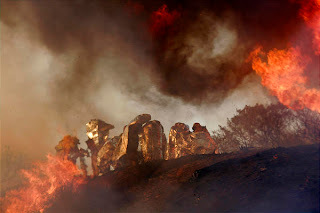 Firefighters held the main body of the Santiago Fire to the west side of Santiago Canyon Road, which was a critical control line for keeping the fire out of the communities of Silverado and Modjeska Canyons. On 10/22/07 at approximately 1530, firefighters discovered that the fire had jumped Santiago Canyon Road approximately 200 yards south of Call Box SC-13. Two teams of firefighters immediately initiated two separate but coordinated progressive hose lays anchored on the eastern edge of Santiago Canyon road. One hose lay progressed along each flank. The hose team on the left flank consisted of two members from Engine-22, three members from Engine-9, three members from Engine-34, three members from Patrol-16, and one member from Engine-53. The left-flank hose team had reached (or nearly reached) the top of the 200-foot hill when they lost water, apparently due to one or more ruptured hose lines. With fire below, the progressive hose team leader selected a level site at the top of the hill and ordered all twelve members to deploy their shelters. OCFA helicopter(s) made one or more high-priority water drops on the fire immediately adjacent to the deployed firefighters. The firefighters remained in communication while they were inside their shelters. Once conditions were cool enough, all twelve firefighters exited their shelters and walked unassisted down the hill to Santiago Canyon Road. All twelve firefighters were evaluated on-site, and then transported to OCFA Fire Headquarters for further evaluation. None of the firefighters required treatment at a hospital. Recommended Actions: All firefighters should review and practice Lookouts, Communications, Escape Routes and Safety Zones. All firefighters should regularly review and practice fire shelter deployment. Commanders should develop procedures for managing deployment emergencies. Tag! Tell us about your missionary experiences. Poetry: How shall I serve them?